Sneak Peek: Moving my office to the coral room! Sometimes I feel like all I ever get done doing is rearranging furniture and rooms. And I'm pretty sure it's hereditary in my family. Haha. (Looking at you, Grandma.) 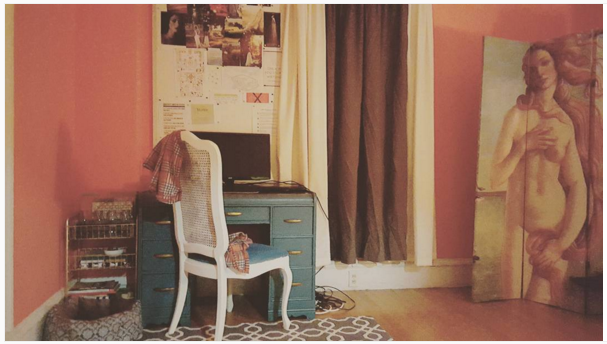 Anyway, I decided to move my office into the front room, which is painted coral. Except for the Birth of Venus folding screen that hides Dahlia's litter box, a coat tree, and a small table by the door, this room has sat mostly empty the year time I've lived here. And that's a shame because it's a big open room with beautiful windows. Pictured above is a little inspiration board I put together to help guiding me in curating and decorating the space. I want a nice blend of bright turquoise and coral balanced out by black, white, and gray. And since this is the first room I come into, I want to integrate my coat tree, boot tray, and entry table into the space in a way that looks natural and fitting. I spent a recent night moving and rearranging furniture. Forgive the dark photos – it was evening and this room has no overhead lighting, which makes it especially cozy but difficult to photograph at night. 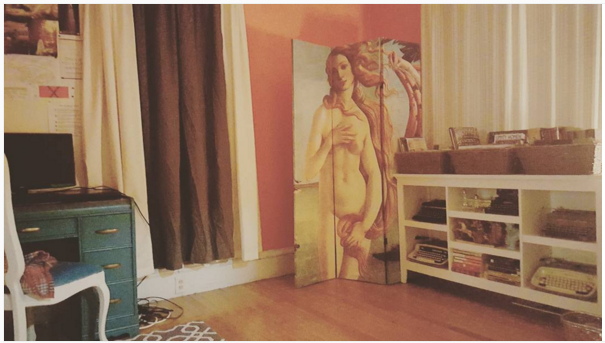 I'm playing off of the colors in my Birth of Venus folding screen to inspire the rest of the room: coral, cream, and shades of blue-green ranging from turquoise to jade. Plus, I'm adding in some dark gray and black to ground things – and some bits of gold here and there for some sparkle. I love how incidentally the hardwood floors match Venus' reddish-blonde hair. What a happy coincidence! I'm still working with my bookcase. It was purchased with the gray room (and its pesky floor vent in mind), so I'm still figuring out how to style it in here. Yes, right now most of my books are in baskets and the typewriters occupy the shelves. So maybe I should call it a typewriter-case? I like it so far. I'm still definitely tweaking and making adjustments, but I'm finding the bold coral to be really inspiring. And I love finally seeing this room used as something besides a massive, empty entryway space. 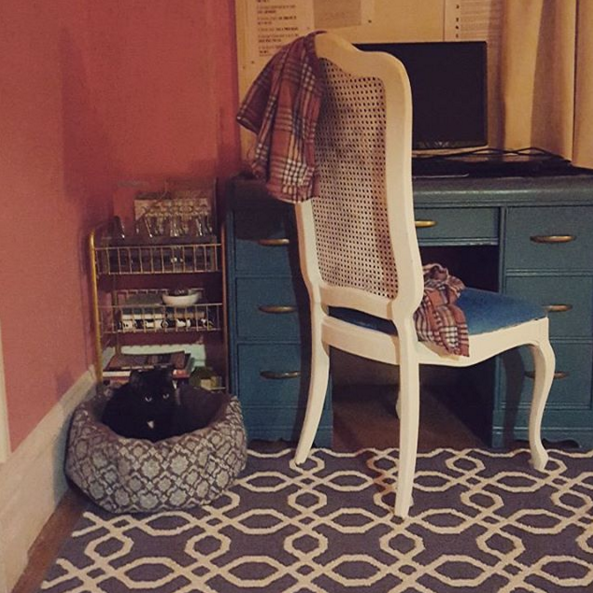 Dahlia approves, too – especially with her cat bed nestled right next to my desk. P.S. Here's my office before (in the gray room). I think Dahlia was crucial to the entire rearrangement!